David Jaap van Leeuwen was born in 1952 in San Francisco, California where he attended public schools. His father Jaap van Leeuwen was born in Holland in 1912 and came to the United States after the Second World War. He became a commercial artist and soon met and married David's mother Eleanor. Eleanor was born in Kentucky in 1909. She was a pre school teacher and a musician. Both of David's parents influenced him greatly. His father Jaap, the artist and the world traveler, planted the seeds of adventure and excitement that international travel could bring, and encouraged David in his artistic interests. His mother Eleanor, the teacher and musician, was nurturing and supportive, encouraging David in his love of both art and music. David is a 1974 graduate of Friends World College, a four-year experiential college that encouraged world travel, apprenticeship and independent study. During his time in college, David had many formative experiences. His first experience teaching art to children was at the Alvarado school art program in San Francisco. He also worked at Palo Soleri's Cosanti bronze bell foundry in Scottsdale, Arizona. David went to Holland in 1971 and studied at the Academy for Art and Industry where he built a geodesic dome. He had plans to go to Africa but instead moved to Bolinas California in 1972. As a Friends World College student he volunteered for one year at the Bolinas-Stinson School's art shop, as a teacher's aid. He was hired the next year and the teaching position became a full time job. After David's graduation from Friends Word College in 1974, the transition between college and a full time job was seamless. 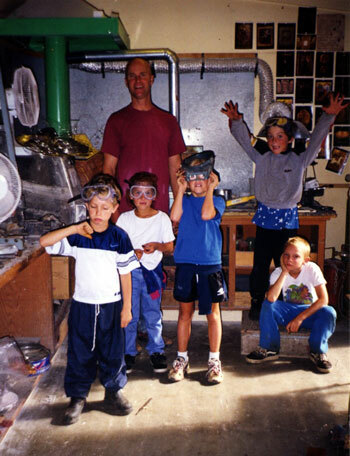 David has been the art metal shop teacher at the Bolinas-Stinson School since 1972, with a leave of absence to travel and pursue his craft as a jeweler. He teaches kindergartners through eighth graders various metalworking skills from lost wax casting and rubber mold-making to jewelry fabrication. He also teaches stone cutting and stone setting. Teaching is the chance for David to share his own personal interest and passion for art with children and gives him the opportunity to make a contribution to his community. 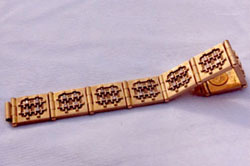 As a jeweler David made containers, rings and bracelets using gold, silver, rubies, sapphires and diamonds. 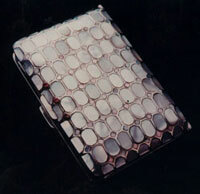 His jewelry work has been displayed in the San Francisco Neiman Marcus store. He later became interested in large-scale metal sculpture. Spending several years on a single sculpture was something David accepted, as he always loved the process. He learned that the real skill required for this type of artistry was patience. Combining patience and passion is his driving force. He challenges himself to take each piece that he makes to a higher level. He approaches sculpture like he does jewelry, with patience, passion and a fine eye for detail, color and light. His first journey to Southeast Asia in 1980 was an important life experience and crossroad in David's life. He continues to return there for inspiration and for the adventure that travel brings. He has been to Laos, Cambodia, Thailand, Vietnam, Indonesia, Nepal and to his favorite country, Myanmar, commonly known as Burma. His love for Southeast Asian art, architecture and people has influenced him in many ways. That love is a big part of his life and has influenced him greatly. 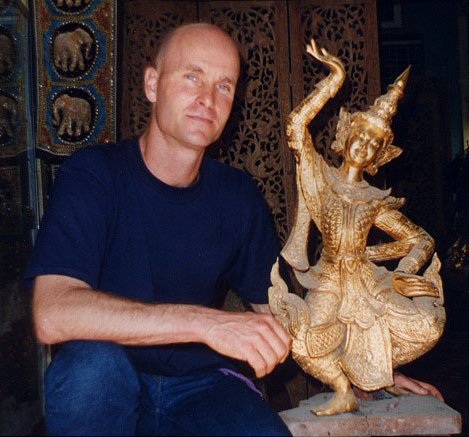 David began teaching rubber mold making and concrete casting in a Burmese Buddhist monastery in 1999, another important and pivotal point in his life. He realized that he could make a contribution as a traveler and do something more meaningful and worthwhile, something that would help the people and culture that he had become so fond of. Since then, David has been back to Burma every year teaching rubber mold making and concrete casting in Burmese Buddhist monasteries. With the help of many friends, he has been able to fund many humanitarian projects in Burma as well. The emotional rewards are so great and satisfying that this is what David wants his life to be about. His love for travel, art and the Burmese culture has grown into something much bigger and greater than himself.